Here is a collection of some post processing filters in GLSL I found on the web about fish eye and other barrel / dome distortion. For each filter, I coded a small demo with GLSL Hacker that shows the effect in action. 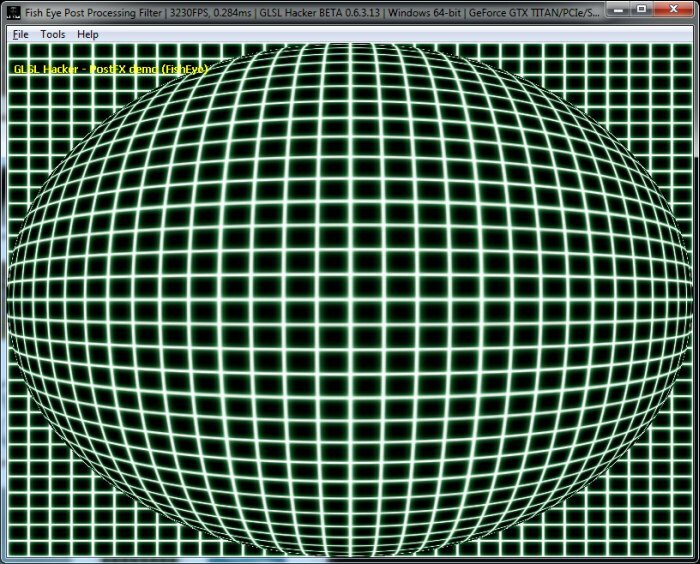 You will find all demos in the code sample pack in the host_api/PostFX/FishEye/ folder. All demos require the latest DEV version (0.6.3.13) of GLSL Hacker (Windows, OS X and Linux). As usual, all the following GLSL shaders can be used in any OpenGL application with minor changes only (shader inputs). Other types of post processing filters can be found in the Shader Library. cool shaders! I especially like Fish Eye Lens Shader.